Railroading has long been considered a “family affair” in which multiple generations of a family might work in the same craft, or take on positions across a variety of fields. Building on this sense of community, Amtrak began holding a series of “Family Days” celebrations in cities across the country, starting with Washington, D.C. in February 1979. The events quickly blossomed into opportunities to invite the public to learn about the company and show off new equipment. 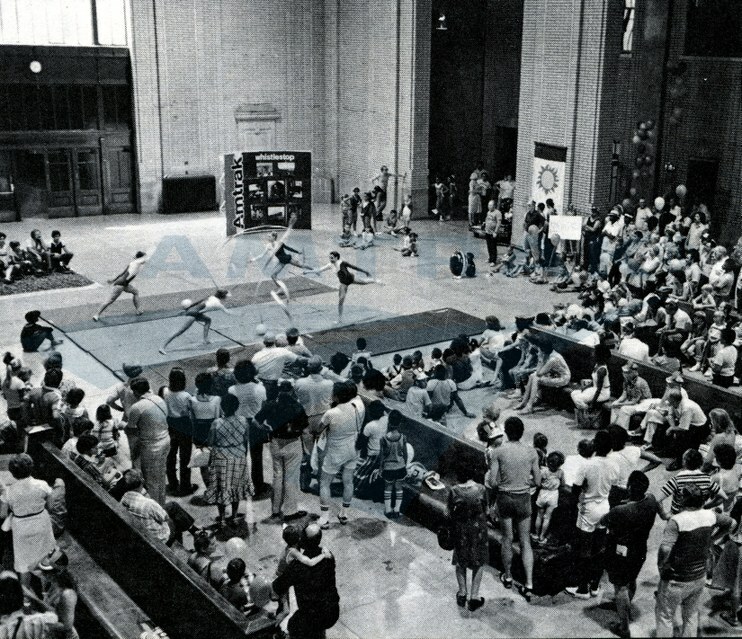 At events held in larger stations, it was not uncommon to receive 30,000-40,000 visitors over two days. 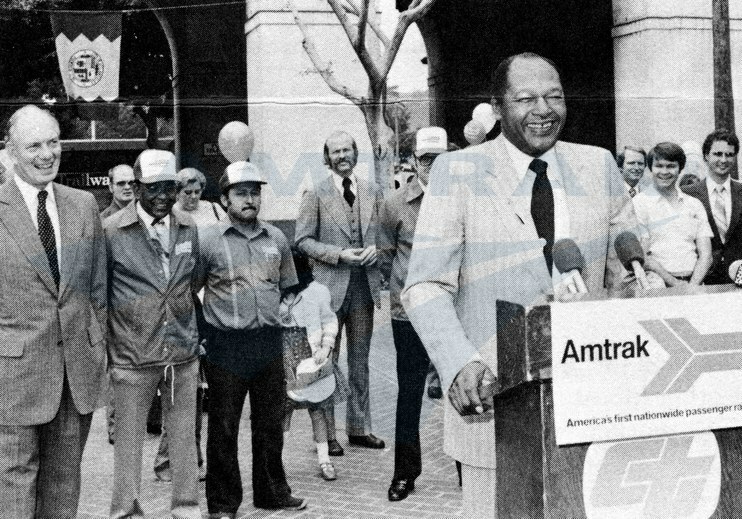 Days in Los Angeles with Amtrak President Alan Boyd (far left). Amtrak, established by an act of Congress in 1970, had much to be proud of as it neared a decade of service. Assuming the passenger rail obligations of 20 railroads, it created the country’s first truly national passenger railroad, stretching from one coast to the other. But with a national system there also came challenges as the company labored to create an organizational framework; hire and train employees; upgrade and standardize rolling stock and station facilities; institute a comprehensive national reservations system; and craft an advertising campaign to inform the public about its services. One of the most visible changes for travelers was in the equipment, all of which initially had been purchased or leased from the predecessor railroads. The newest cars dated to the mid-1960s, but many had already seen decades of regular service. Mechanical and electrical overhauls were needed on roughly a third of the fleet, as were refurbishments to the interiors. Attendees in Detroit explore old and new equipment. 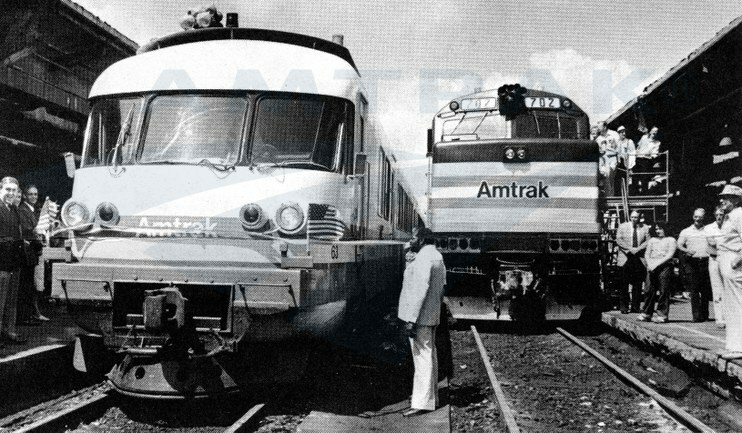 Amtrak leased and ordered a variety of new equipment in the 1970s, including the gas turbine Turboliners, based on a French design; single-level Amfleet cars, primarily for use on eastern routes; and bi-level Superliners intended for western trains. New locomotives ordered included the diesel SDP40F and F40PH, as well as the electric E-60 used on the Northeast Corridor. The arrival of this new equipment allowed Amtrak to begin retiring some of the oldest units, thereby lowering the average age of the locomotive and rolling stock fleets while increasing reliability. At many of the Family Days celebrations, old and new equipment was displayed side-by-side so that attendees could see the stark difference in their condition and passenger comfort. gymnastics, singing and mime performances by local youth. Following the first celebration in the nation’s capital, the Family Days took on a similar format. Amtrak employees and their families were invited to an equipment preview on Saturday morning, after which the event opened to the general public. Attendees could stop by the Amtrak booth to pick up brochures about routes and vacation packages. At Los Angeles Union Station, personnel from the local reservations office set up “an eye-catching booth…using large display boards that were decorated with posters, signs and promotional materials…personnel on duty even took train reservations which were later shuttled to the Central Reservations Office for insertion into the computer.” Amtrak’s enthusiastic employees were truly the best ambassadors to market its services. Other booths were manned by passenger rail advocates, departments of transportation, Operation Lifesaver and vendors of food and railroadiana. Excursion rides on modern, new equipment such as the Turboliner were always popular. Giveaways usually included balloons, buttons and paper engineer’s caps for kids. An article in Amtrak NEWS about the LA event recalls: “The Amtrak and Trailways balloons and engineers’ caps distributed by the Santa Fe [Railway] led to a friendly rivalry between all three as to which had the best exposure in the crowd.” Meanwhile, adults could sign up to win free train travel. For those lucky enough to get a ticket, Amtrak arranged excursion rides using the most modern equipment. From Los Angeles, a Superliner-equipped train headed to Glendale and back, while in Detroit, visitors could check out an RTG Turboliner on the way to Wayne Junction. Visitors walk through the cab of a F40PH locomotive. The highlight of any Family Days celebration was most likely the equipment displays, which were strategically arranged to allow visitors to compare the existing older cars and locomotives with brand new rolling stock. In Los Angeles, an old steam-powered coach was contrasted with a coach, diner and sleeping car that had been converted to modern electric head-end power. Further down the platform, an ex-Santa Fe Railway café-lounge-observation car was compared against a gleaming new Amfleet dinette, while an ex-Santa Fe Hi-Level transition coach-dormitory found its modern counterparts in a Superliner coach, diner and sleeping car. The latter was an especially apt grouping since the popular Hi-Levels served as the model for the new bi-level Superliner equipment that first entered service in October 1979. For those more interested in motive power, SDP40F and F40PH locomotives were also on view. Visitors at Los Angeles could also see a variety of historic and modern buses, such as a double deck 1929 Gray Lines sight-seeing bus, a Grumman flexible transit bus and a Los Angeles Regional Transit District bus. A growing interest in intermodalism would land a painting of Los Angeles Union Station on the 1981 Amtrak calendar. Against the background of the glorious Art Deco station and its soaring tower, two Amtrak trains—with Amfleet and Superliner equipment—framed a collection of intercity and local transit buses. Detroit's Michigan Central Station during Family Days. Events in Detroit and Indianapolis centered around the introduction of new services: the Lake Cities (Chicago-Detroit-Toledo) and Hoosier State, respectively. Crowds cheered as the Lake Cities, using Turboliner equipment, “arrived promptly at 12:20 [Sunday] and sliced through a red, white and blue ribbon stretched across the tracks” by U.S. Representative Carl Pursell and Detroit Deputy Mayor Richard Simmons. The Hoosier State, which began operating a few days before the Family Days event in October 1980, marked the return of passenger rail service to the city following the discontinuance of the National Limited the previous year. Although Family Days ceased by the mid-1980s, their spirit lives on in a new Amtrak tradition: National Train Day. Inaugurated in 2008 and celebrated each May, National Train Day marks the way that trains—intercity passenger, commuter and freight—drive the nation’s economy and connect us to one another. Attendees enjoy displays of historic and modern equipment, live entertainment, fun kids’ activities and train rides. Do you have any Family Days memories? Share them with us! National Railroad Passenger Corporation, Fiscal Year 1980 Annual Report. 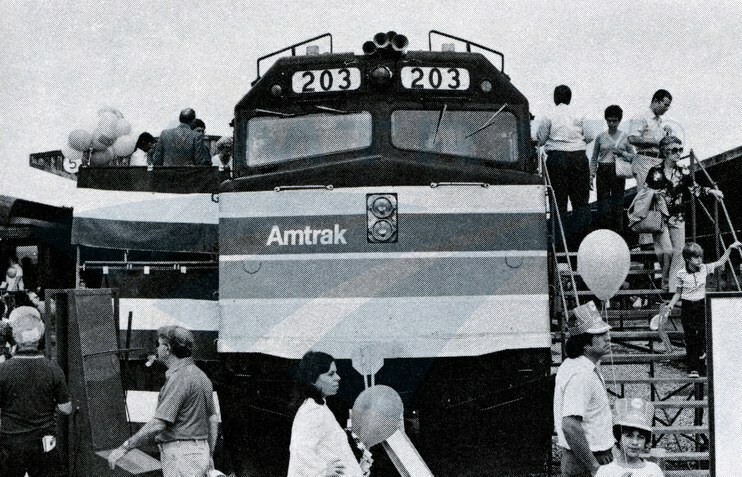 ----, “Detroit Family Days Attract 30,000 Visitors,” Amtrak News, August 1980, 1-3. 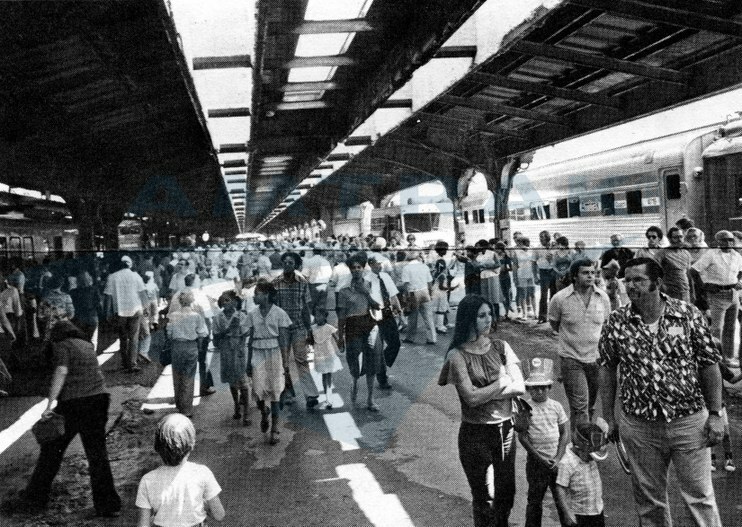 ----, “Record Crowds Jam Station For Los Angeles Family Days,” Amtrak News, September-October 1980, 1-2. ----, “Indianapolis Host Family Days, 12,000 Attend Equipment Show,” Amtrak News, November 1980, 4.